This lovely newly 3 bed Villa has a lovely sunny private pool area and is set just a few minutes walk from the resort centre and beach. 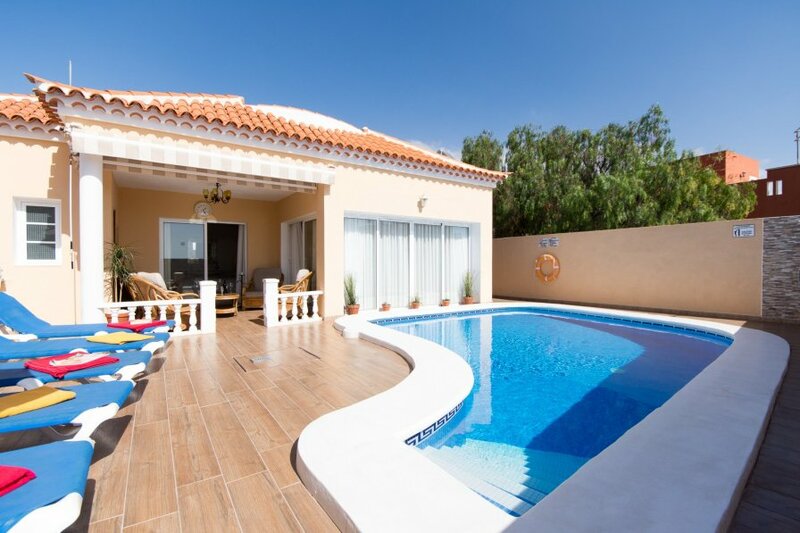 A lovely villa to rent in Callao Salvaje, Tenerife. This spacious 3 bedroom 2 bathroom detached villa with private heated pool is set in the residential resort of Callao Salvaje, Tenerife. This Tenerife Villa is all on one level has been furnished to a good standard throughout. The owners have included some typical Spanish furniture along with traditional British style as well. The kitchen includes marble work surfaces, dishwasher, oven/hob, fridge/freezer, microwave, toaster, sandwich maker, iron with board etc. Off the kitchen is a door that leads to the utility area which includes the washing machine. This unique villa has a large lounge with dining table plus another separate dining area. The comfortable lounge/diner has a 3 x 2 seater sofas seating 6 guests plus and a dining table and chairs that seats 6. This room also has TV which includes British TV channels and DVD player. The lounge/dining area offers two sets of patio doors that lead onto the pool terrace and shaded seating area. Bedroom one has a king size bed, fitted wardrobes with plenty of wardrobe space, ceiling fan and patio doors leading to pool terrace, there is also a fully tiled en suite bath with shower attachment and 2 vanity sinks. Bedroom 2 has a double bed, fitted wardrobes, ceiling fan. Bedroom 3 has twin beds, fitted wardrobes and ceiling fan. The fully tiled modern family shower room has a large shower cubicle. There is a safe in the villa for you private use. This villa sleeps 6 adults plus baby. This villa provides cots and highchairs upon request. Wifi is included free of charge. The 7 x 3 metre private shaped heated pool has depths of 1.00 to 1.60 metre and has stylish roman steps for easy access and is surrounded by a terrace with sunbeds plus a large pergola for shade with quality table and chairs for 6. There is also another shaded snug area with sofa and chairs for your comfort. There is private parking inside the villa at the front entrance. The villa is looked after by a local management company whos details will be sent to you when you have booked. You will find them very helpful. Many people book the villa reassured that they are close by if required. They can also provide hired cars too and can leave them at the airport for you. This villa is located on the south west coast of Tenerife in a peaceful resort called Callao Salvaje. Callao Salvaje is situated directly in front of the island of La Gomera and offers magnificent views especially at sunrise/sunset. The resort also has a new beautiful man made beach which was completed in 2012, it has its own little jetty which is very good for fishing, snorkelling etc. The apartment is in the centre of Callao Salvaje in a good position where you will find hotels, restaurants, bars, shops, supermarkets, banks, taxi rank, bus stops, pharmacy, doctors, cafes, bakery, butchers, tennis courts and football pitches etc. This resort does have some fantastic restaurants which are well known over the island, it also has late night bars with entertainment. Callao Salvaje is only a 10 minute drive or 15 euros in a taxi to the busier areas such as Los Cristianos and Las Americas. The wonderful golf courses in Costa Adeje and in the Abama aswell are only a short drive away. The private pool is heated.